Getting an Ultrasound doesn't have to be a scary thing. What is getting an Ultrasound like? 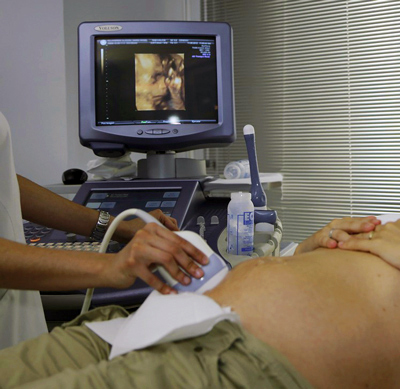 An ultrasound, also called a sonography, uses sound waves to develop ultrasound images from inside of the body. The procedure is not risky, as it uses no radiation. The procedure is also generally painless. What should I expect before an Ultrasound? You should prepare by wearing comfortable clothing that is easily removable. You may be asked to remove all clothing and jewelry, as well as possibly asked to wear a gown during the procedure. Preparation prior to the exam will be different depending on the type of ultrasound examination you are having done. Some ultrasounds require you not to eat or drink up to 12 hours prior to the examination. Others may request that you have a full bladder prior to the examination. Necessary medications may be taken with minimal amount of water. Your physician may have other instructions for you to prepare before the examination. If you have questions, be sure to ask prior to the exam as well.